Some days I'm just too tired to jiggle a piece of string. 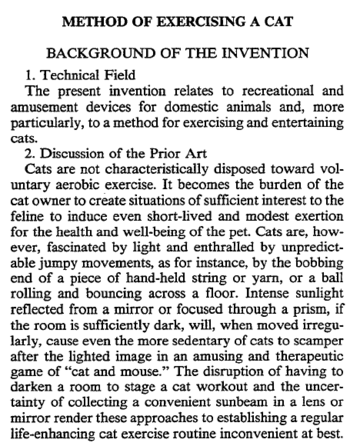 If only there were an easier and more convenient way to get my cat to engage in voluntary aerobic exercise…. Utilizing the method set forth in this patent, namely the waggling about of one (1) handheld laser apparatus, will make these problems a thing of the past. See FIG. 1, below. 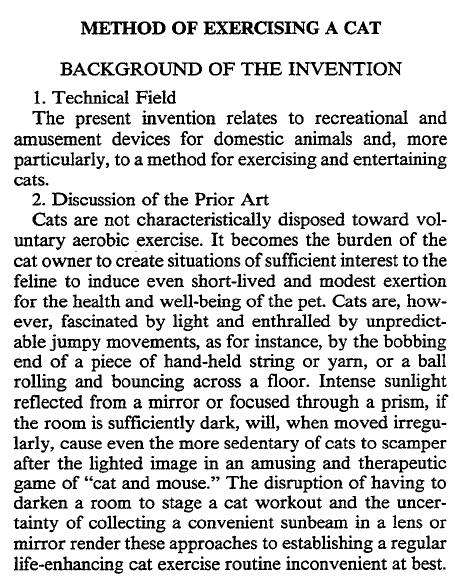 Ideally the bright pattern of light is directed along the floor, steps or wall at speeds sufficient to exert and entertain the cat but not so discouragingly fast as to dissuade against the chase, i.e., typically in the general range of 5 to 25 feet per second. In other words, the angular sweep speed of the laser beam is controlled by the cat owner 12 to effect an appropriate linear sweep speed of the pattern on the opaque surface within the stated general range. It is understood, of course, that the angular beam sweep speed required to effect a given linear pattern speed depends upon the distance between the laser and the surface on which the pattern impinges; specifically, as the distance between the laser and the surface increases, the same linear pattern speed is produced by a slower angular beam sweep speed. Release of trigger 18 interrupts the power circuit and extinguishes the laser beam, whereupon the cat can return to more traditionally feline time passing until cat owner 12 re-initiates the laser cat exerciser. The prayers of Cat Owner 12s everywhere have been answered. 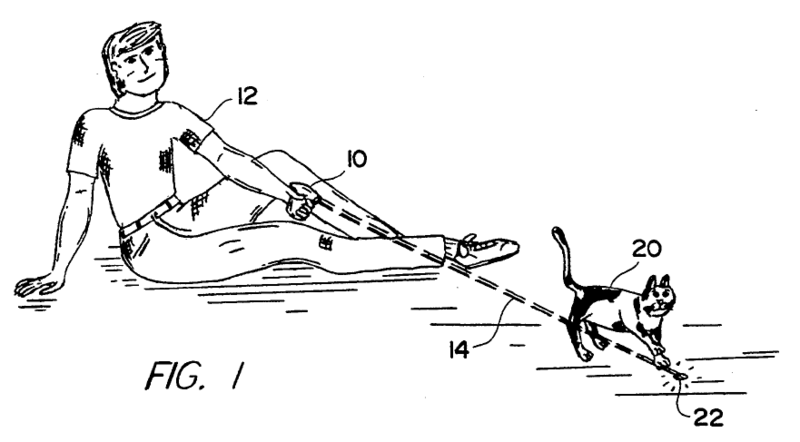 Or, more specifically, they were answered in 1995, when this patent was granted. If you have been exercising your cat in this manner since then, technically you've been infringing.